When something is suddenly wrong with your vehicle’s transmission, bring your car to Mr. 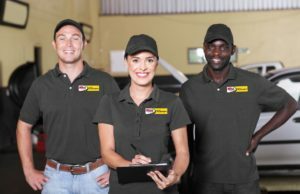 Transmission Milex Fayetteville GA. We can run the proper tests to determine exactly what the problem is and what sort of transmission maintenance is needed. Luckily, 60% of the time transmission problems are not major. You can trust the experts from Mr. Transmission Milex Fayetteville GA to know the best course of action to get you back on the road. Regular transmission maintenance from Mr. Transmission Milex Fayetteville GA can prevent unexpected breakdowns that can leave you stranded by the side of the road. As the miles on your car add up, a natural amount of wear-and-tear will occur. High temperatures and stop-and-go traffic add strain to your vehicle and transmission leaving you susceptible to breakdowns. Proper transmission maintenance can leave your car with smoother gear shifting, reduce component failure, and provide an overall increased level of performance and vehicle longevity. There are a number of signs to be on the lookout when it comes to transmission maintenance. If you notice any of these signs or others, bring your vehicle into Mr. Transmission Milex Fayetteville for transmission maintenance right away. We offer a free performance check to determine if anything is wrong. Our knowledgeable technicians can pinpoint any problems through our extensive diagnostic checks. If needed, we will disassemble your transmission, cleaning and inspecting each component carefully. Our diagnostic checks always come with a cost estimate of all needed repairs. Our transmission maintenance services at Mr. Transmission Milex Fayetteville GA come with a 12-month/12,000 mile warranty. Transmission maintenance services from Mr. Transmission Milex Fayetteville GA are available to our customers in Peachtree City, Jonesboro, Fayetteville, Lovejoy, and Newnan. We proudly provide service for automatic and manual transmissions and for both domestic and foreign models. Don’t wait until you are faced with a major problem. Drive a safe and reliable vehicle with regular transmission maintenance from Mr. Transmission Milex Fayetteville GA. Schedule your appointment today or give us a call for more information.